How long does is take to make a web site? What are the steps involved? Here is a web design timeline to answer some of these questions. This timeline only pertains to how goffgrafix works. Other web design companies may approach the process of creating a web site differently. Below is a diagram that I've created to show how many pieces there are to a successfuly built website. Below are questions that I send to a prospective client before our initial free consultation. The first step to developing a web site is to figure out exactly what the function of that web site is going to be. I say in my tag line "It's about form and function." This is really the bottom line. The form is how the web site looks, the function is what is does, and how effortlessly or intuitively it does it. You need to have thought out what role you want your web site to play in your business in order to have a good design developed. For example: Is it to sell a product? Is it an on-line catalog? Does it tell a story? Is it an educational tool? Are you using it to support a cause? Is it entertainment? Do you just want it to answer a bunch of those questions that people are calling and pestering you with: hours you're open, contact info etc. A web site can have more than one function, however it's good to have a clear idea of what those are before you meet with your web designer. The next step is to figure out what you want, generally, your web site to look like. Do you have a logo and printed material developed for your business? It is important that your web site maintain the visual graphics of your other marketing. You are not expected to come up with a design at this point, however, the more you've thought about what you like, and what you don't like, and can communicate this to your web designer, the quicker the design process is going to be. I've developed a questionnaire to help with this process. Click here for the questionnaire (This is a pdf document to print, fill out and bring to your first web site consultation.) Another good resource is this "Building a web site worksheet" with a link to an animated tutorial that covers a lot of informative topics. Now is when you sit down with me for a free one hour consultation. You bring all your notes about the function of your web site, and how you want it or don't want it to look. If you have any printed material about your business, bring that as well. And finally, just like you need an office building or room to house your staff, you need a hosting server to host your web site. This is a server that is dedicated to housing people's web sites, that is connected to the internet at all times with high speed access and back-up capacity and generators etc. The initial meeting is a good time to start talking about search engine optimization and marketing as well. It is important to start researching who your target audience is, how they are going to find your site, and what will make them stay on your site, and what you want them to do when they arrive at your site. The answers to these questions effect every step of the web design process. If you are planning on working with an SEO specialist and marketing/usability specialist, get them involved in this initial meeting. It is super important that the site is built with an optimized for the correct targeted keywords. You want keywords that will drive visitors to your site who want what your site is offering. I can get you started in the right direction researching keywords, if this is something that you'd like to do on your own. I also have colleagues who are search engine specialists who I can refer you to. After this meeting, I come up with an estimate. If you want to proceed, a deposit is paid towards the design and work commences. If you don't already have a domain name, this is when we register one for you. What that means is we pay a fee to reserve a name so that no-one else can use it. I offer domain name registration for $15.50/year. I also include it in some of my web design packages. When registering your domain name, think about the targeted keywords that you will be using to drive traffic to your site. (Search engine optimization). Having your keywords in your domain name can help your search engine placement. I start with the graphic design or look of the site, and how the navigation is going to work. It is really important that the site reflect your company visually. You want people coming to your web site to recognize you in it. It is also important that the graphic design helps the site function, and doesn't confuse people. Clear, intuitive navigation is essential. The type of programming use, the platform that we build on, how the graphic design is coded will effect usability and search engine optimization. I take the information that you've supplied from your logo and printed material, our inititial meeting and the answers to those questions that you downloaded earlier, and I put together a "look" for the site. I send it to you to review. You give me feedback, and I make revisions. This may go back and forth anywhere from one to four times. It is important that you have given me sample content for each of the areas of the site, so that I can design how to present the content on the site. The graphic design isn't just pretty, it's usability. It is important to be clear about what you want visitors to do when they get to your site. There is lots of research on what parts of a web page people look at the most, how colors effect behavior, how to write effective content. The graphic design and layout of content is a balance between visual branding and persuasion. Sometimes this process wraps up in a week. Sometimes it can take a month to come up with a design that fits. What makes it a speedier process is very honest, clear feedback, and trying to get that feedback to me within a couple days of receiving the proof. What tends to slow down the process is when a client changes their mind, or doesn't know their own mind, or is afraid to say if they don't like something. Click here for some examples of how graphic designs evolved for different clients. If you are having a database driven site designed for you, I start the design of the database and templates at this point. Meanwhile you need to gather all the content for the web site. If it has photographs, you need to supply those. If it has video, music, text, all of that needs to be gathered and organized so that it can be inserted into the web site. If you need legal documents, disclaimers etc. they need to be produced. If I am putting up a shopping cart for you, I will also be asking you to supply any information relating to selling products: shipping, tax, custom receipt messages.. Think about search engine optimization. I've put together a page about it. As you write the text that will be on your web site, or as you have it written, if you already know what those key phrases are that you need for search engines, you can make sure the text includes them. This saves re-writing down the road. The amount of time this part takes depends on the individual client. I've had some clients get me content within days. I've had others take months. Now the content is incorporated into the web design. The time length of this depends on the size of the site. If the site has a content management system, I will ask you to be involved in the data input - or uploading the content. This will familiarize you with how to use your CMS and will empower you when you need to make future changes. Once the content is put into all the pages, the next step is proofing. It is really important to have more than one set of eyes proofing a project. If we've agreed to it in the quote, I may already have hired a proofer to go through the content before I send it to you to proof. However, even if I had five people proofing the content, you would need to look through it to make sure that it is presented accurately and in a manner that you like. You then send me any small edits that you might have found, and we make those changes. You do a final proof, and give the OK and the site goes live. I hope this was helpful. I've had some web sites go up in days. I've had others take months to complete. It all has to do with how efficiently these steps are completed. 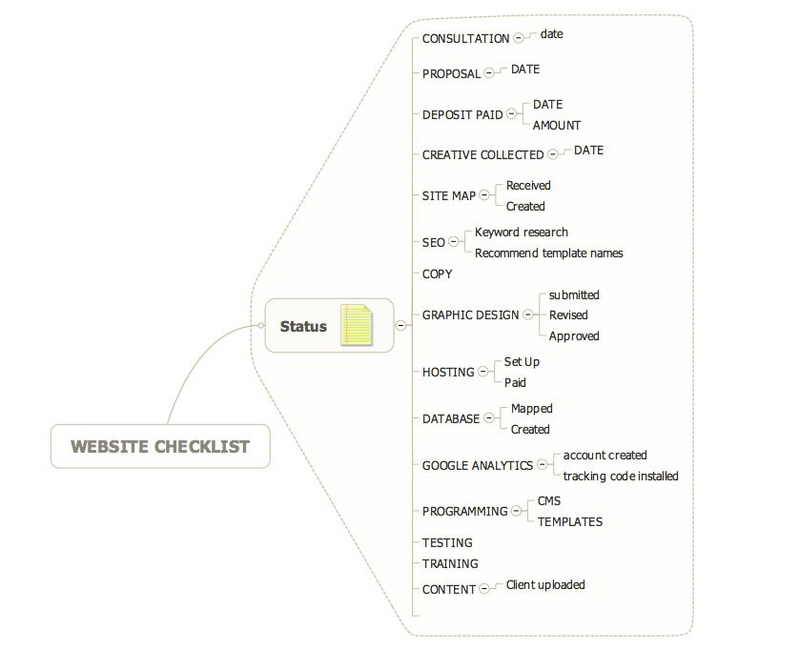 Below is a screen shot of the check list that I keep for each web design project. I have copied this work sheet directly from a web site (virtual adviser) that has a wonderful animated tutorial on what you need to consider BEFORE building a website: http://va-interactive.com/score/buildwebsite/ (will open in new browser window). This is a very instructive animation that will answer a lot of your web design questions before you visit your web site designer. These are many of the topics that I cover with clients during our initial free one hour consultation. Oh how wonderful it would be if we could just sit back and let our web sites earn money for us, without having to lift a finger! Even the occasional nickel and dime to help pay the hosting costs, or finance a cup of coffee. I have numerous clients who ask me about passive income, so I decided to explore several avenues, and here is what I learned. Article by Michael Antoniak about creating virtual tours for your real estate site. This article contains links to many resources. Quanta Web Design put together this extensive list of directories where you can submit your site for free. Dodgy referrers in your stats? Are you one of those people who check your web statistics and referring sites frequently? Ever find a referring site that is sleazy? and wonder why on earth it links to yours? I just came across this post in webproworld that explains why those links show up every now and then. they miss page elements due to a narrower field of view. What's the difference between ISP, Hosting, Domain Registration? Confused about the lingo? Here's an article I put together to try to explain what it all means. What is usability? How, when, and where can you improve it? Why should you care? This overview answers these basic questions. View a list of Jakob Nielsen's bi-weekly articles on web usability. These web pages answer a lot of questions you may have about how google works and why your web page ranking fluctuates.